R. Alex Anderson composed Mele Kalikimaka in 1949. 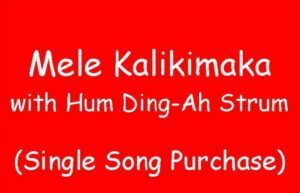 This hapa haole song is Hawai’i’s popular Christmas song. Did you know that the ancient Hawaiians did not celebrate Christmas until after the arrival of the missionaries? Christmas occurred during the Makahiki, the four month period of resting and feasting when ancient Hawaiians honored the earth for giving them plenty to eat. No conflicts or wars were allowed during this time. After the Hawaiian embraced Christianity, it was only natural that they adapted some of the traditions of Makahiki to the celebration of Christmas. 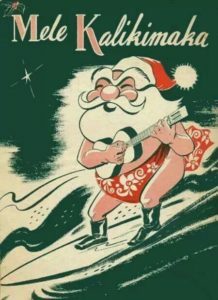 R. Alex Anderson composed Hawai’i’s popular Christmas song “Mele Kalikimaka” in 1949. He was born in Honolulu in 1884 and composed nearly 200 songs before his death in 1995. As the story goes, in 1949 Anderson was in his office in Honolulu when his secretary, a woman from the mainland, mentioned that she had never heard a Hawaiian Christmas song. Thus, he composed Mele Kalikimaka and it became an enduring classic. Bing Crosby and The Andrew Sisters made one of the earliest recordings on 78 rpm and 45 rpm phonograph records in 1950. This hapa haole song (Hawaiian style music with English words) is arranged in the key of D with seven chords and uses the Hum Ding-Ah Strum for ‘ukulele. It is Hawai’i’s way to say Merry Christmas to you. Ukulele Mele’s arrangement of “Mele Kalikimaka” uses seven chords and the Hum Ding-Ah Strum for ‘ukulele. Click to download the single song lesson today! The Ukulele Mele song arrangement uses a smooth Pick in 4 Strum and is sung in the key of C with 20 ukulele chords. You are invited to sing and play along the Ukulele Mele arrangement of Over the Rainbow/Wonderful World for the Fan Club’s featured “Song of the Month” for November. 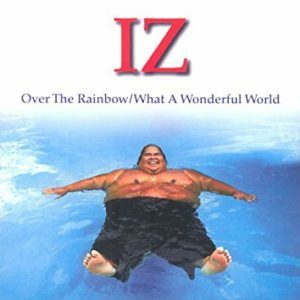 Braddah Israel “IZ” Kamakawiwo’ole made this medley popular with his reggae beat to the music by Harold Arlen and lyrics by E.Y. 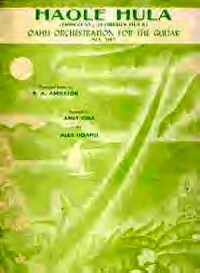 Harburg in 1938 (printed sheet music in The Hawaiian Sheet Music Collection by Alfred Publishing Co in 2008). My arrangement is different as I hear the medley in a slow soothing style of Pick in 4 Strum and sing it in the key of C with 20 chords. It is a challenging arrangement for advanced ‘ukulele players who want to build their repertoire. Schedule private webcam lessons to learn to play the song from wherever you live. You can learn to form ‘ukulele chord shapes with minimal muscle strain while strumming rhythm patterns taught by no one else. Song sheets including chords and lyrics are emailed to you. There is no need to read musical notes. Audio recordings are provided for you to play along with professional musicians who sing and play ‘ukulele and u-bass (sometimes with drum machine accompaniment). There is no need for you to sing and play your instrument at the same time unless you want to. You can receive feedback from a professional educator and entertainer with over 50 years of ‘ukulele playing and entertaining experience. You gain an authentic Hawaiian cultural experience learning to play Hawai’i’s official instrument, the ‘ukulele, from a Native Hawaiian who teaches the old Hawaiian way. Visit my online Fan Club to listen to over 100 audio recordings of Hawaiian, hapa haole, pop, and Christmas songs you can learn to play the Ukulele Mele Way with private lessons via webcam or on Maui. Select the Fan Club’s Song of the Month or another song to learn during your lesson. Have fun learning to Watch. Listen. Play. The Ukulele Mele Way today! You are invited to sing and play along to our arrangement of Haole Hula – the FREE Fan Club’s ‘Song of the Month”. You are invited to sing and play along to our arrangement of Haole Hula – the FREE Fan Club’s “Song of the Month” for October. This hapa haole song (Hawaiian style music with English words) was composer R. Alex Anderson’s favorite of the more than 100 songs he wrote. In spite of the worldwide popularity of his song Lovely Hula Hands (which you can also learn to play), the song Haole Hula expresses his love for his island home. My arrangement of Haole Hula with I Wanna Rest Strum is in the key of C and uses 11 chords. It is perfect for intermediate to advanced ‘ukulele players who want to build their repertoire. You learn to form ‘ukulele chord shapes with minimal muscle strain while strumming rhythm patterns taught by no one else. Song sheets with chords and lyrics are emailed to you. There is no need to read musical notes. Audio recordings are provided for you to play along with professional musicians who sing and play ‘ukulele and u-bass (sometimes with drum machine accompaniment). There is no need for you to sing and play your instrument at the same time. Lesson on how to play the song with the opportunity to ask questions is given by a professional educator and entertainer with over 50 years of ‘ukulele playing and entertaining experience. Visit my online Fan Club to listen to over 100 audio recordings of Hawaiian, hapa haole, pop, and Christmas songs you can learn to play the Ukulele Mele Way with private lessons via webcam or on Maui. Select the Fan Club’s Song of the Month or another song. 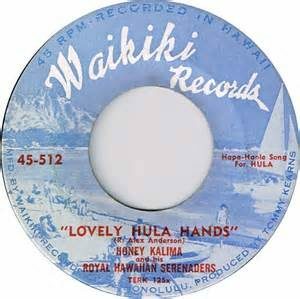 Learn to play Lovely Hula Hands for September’s “Song of the Month.” This hapa haole song (Hawaiian style music with English words) was composer R. Alex Anderson’s most commercially successful song although it was never his favorite. As the story goes, Anderson was at a private party and in the middle of the room a hula girl was dancing. A dozen or so men were standing around just listening to the music when a guy said, “Aren’t her hands lovely?” Right then, Anderson started thinking about a song. It took three or four months during which time Anderson was on a cruise in New Zealand and every day gulls in the back of the boat put the song’s line in his head, “gliding like the gulls o’er the ocean.” The resulting song was an instant hit. Occasionally Anderson used Hawaiian words or phrases in this music, such as in this song. My arrangement omits the original verse and uses the rest of the popular song. Listen to the audio recording in the free online Fan Club. Schedule private webcam lessons to learn to play it from wherever you live. Get feedback from a professional educator and entertainer with over 50 years of ‘ukulele playing and entertaining experience. Learn my method of forming ukulele chord shapes with minimal muscle strain and unique strumming styles taught by no one else. Want a different song? Visit my online Fan Club and listen to over 100 audio recordings of Hawaiian, hapa haole, pop, and Christmas songs you can learn to play the Ukulele Mele Way with private lessons via webcam or on Maui. Hawaii was expected to be America’s 49th state but actually became the 50th state after Alaska. Admissions Day or Statehood Day is a state holiday in Hawaii to commemorate the admission of Hawaii as the 50th state of the union on August 21, 1959. Learn more. 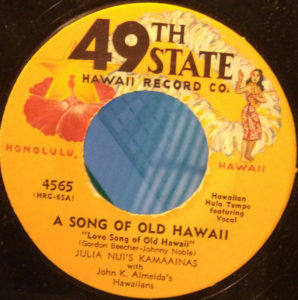 In celebration, learn to play Song of Old Hawaii for August’s “Fan Club Featured Song of the Month.” Note: Hawaii Record Company had expected statehood to occur earlier than it did, but as it turns out Alaska became the 49th state and Hawaii became the 50th state. This hapa haole song (Hawaiian style music with English words) recalls a simpler time. Can you imagine the hula dancers swaying to and fro as the trade winds sigh in the heavens? 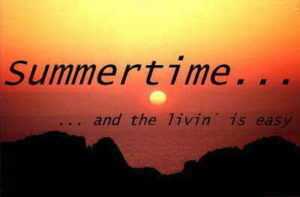 The Medley: Summertime/Moondance is July’s Song of the Month. Learn to play it with two unique ‘ukulele strums. In celebration of the summer season, learn to play a Medley: Summertime/Moondance for July’s “Song of the Month.” This pop medley combines “Summertime” written by Dubose Howard and George Gershwin in 1934 and “Moondance” written by Van Morrison in 1969. Both songs go together well in style and story. Listen to our audio recording. I will send you the PDF song sheets of my arrangement and teach you how to play it with I Wanna Rest Strum and 4 And Strum. The song is in the key of Em and uses 8 chords – perfect for intermediate ‘ukulele players. In celebration of Kamehameha Day on June 11, learn to play King Kamehameha the Conqueror of the Islands for June’s “Song of the Month.” This hapa haole song (Hawaiian style music with English words) was written by Johnny Noble and Ted Fiorito in 1934 and tells part of the story of the king’s conquests in English. I will send you the PDF song sheet for King Kamehameha and teach you how to play my arrangement with I Wanna Rest Strum and 4 And Strum. The song is in the key of C and uses 12 chords – perfect for intermediate ‘ukulele players. 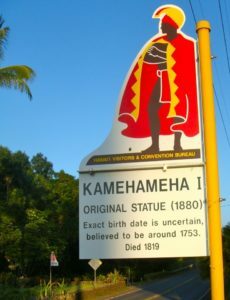 There is another song that ‘ukulele players can learn to play to honor King Kamehameha aka Kamehameha the Great. NA ALI’I is a traditional Hawaiian song that you can learn by downloading the song sheet, video lesson, audio recording and video story behind the story in keeping with Hawaiian oral history traditions. BUY NOW. The song is in the key of G and uses 5 chords – good for ‘ukulele players who play a little (beginners may find it challenging). No need to read music. I will send you the PDF song sheet for May Day is Lei Day in Hawaii and teach you how to play my arrangement with Hum Ding-Ah Strum after you schedule your private lessons. Get feedback from a professional educator and entertainer with over 50 years of ‘ukulele playing and entertaining experience. Learn my method of forming ukulele chord shapes with minimal muscle strain and unique strumming styles taught by no one else. Want to learn a different song? Visit my online Fan Club and listen to over 90 audio recordings of Hawaiian, hapa haole, pop, and Christmas songs you can learn to play the Ukulele Mele Way with private webcam lessons.